• Ten years after the fight to save Naboo from invasion, the galaxy is on the brink of civil war. Under the leadership of a renegade Jedi, thousands of solar systems threaten to secede from the Galactic Republic. A courageous Jedi Knight, his impulsive and headstrong apprentice, and a queen-turned-senator are drawn into the heart of the conflict…and the beginning of war. • The Jedi children Ashla™ and Jempa™ are members of the Mighty Bear ®lan, a communal group of young Jedi hopefuls ranging in age from four to eight. Comprised of many different species, the young initiates rely on the tutelage of Jedi Master Yoda™, who often marvels at the cloudless insight and impressive scope of the young minds. Under Yoda’s careful eye, clan members begin lightsaber™ training at a very early age, but their protective helmets and special training sabers ensure safety in their Jedi lessons. 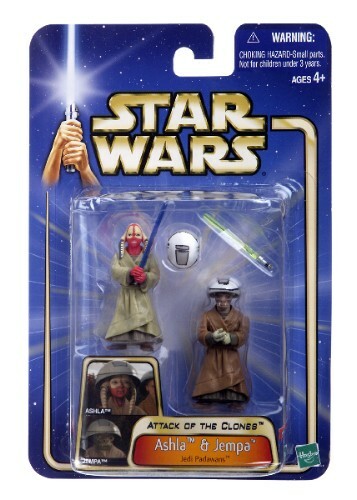 • Figures come with lightsabers and helmets. © 2002 Lucasfilm Ltd. & ® or TM where indicated. All rights reserved. Used under authorization. ®* and/or ™* & © 2002 Hasbro. All Rights Reserved.